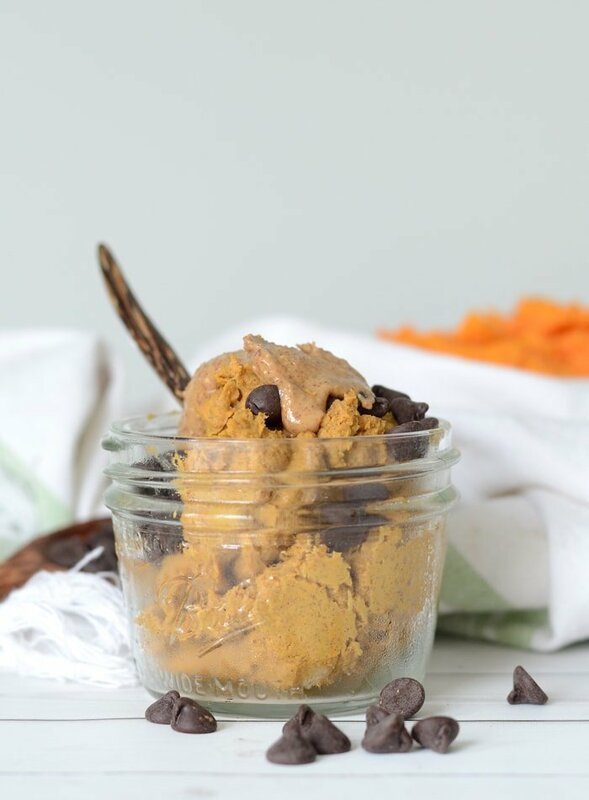 Vegan Protein Cookie Dough - Try it for breakfast! 2-ingredients, sugar-free, low fat. 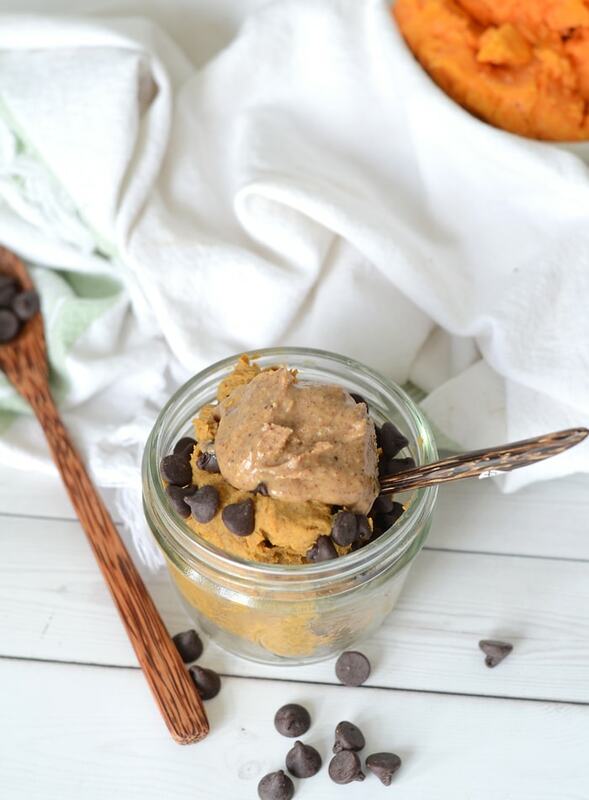 This 2-ingredient vegan protein cookie dough is easily customizable to suit all your cookie dough needs! Try adding cinnamon, ginger and nutmeg for gingerbread cookie dough, peanut butter for peanut butter cookie dough or mixing in some chocolate chips for a real treat! The texture falls somewhere between cookie dough and cake batter, whatever you want to call it, it tastes amazing and is super simple to make. Just two everyday ingredients needed! I usually enjoy it for breakfast with a side of tofu scramble and veggies. It’s a nice alternative to protein oats and a great way to re-fuel after a hard morning workout. I like making a big batch on the weekend so I’m ready for yummy, cookie dough breakfast all week! I will always find a way to include treats in my diet because I love sweets and creating them makes me happy. And when you’re tracking your macros, sometimes you need to get a little creative to fit things in! To make healthier desserts, there are a number of ingredients that make creating lower fat and carb treats a breeze. For a recipe to be considered “macro-friendly”, it’s typically lower in calorie with a good balance of macronutrients. Using the ingredients below to replace fats and carbohydrates can help bring those two macros down in recipes that are typically high in fat and carbs. I like to keep desserts low fat with a manageable amount of carbohydrates and some protein. The more balanced each meal and snack I eat is, the easier it is to keep my macros balance overall. The ingredients listed below are my favourites for making lower calorie desserts. I like to keep these on hand and ready to go! 1. Unsweetened applesauce: replace oil in recipes, yummy mixed with protein, oats and used in other recipes. Try my apple oat protein muffins! 2. Coconut flour: great for lower carb and grain-free baking, pancakes etc. 3. 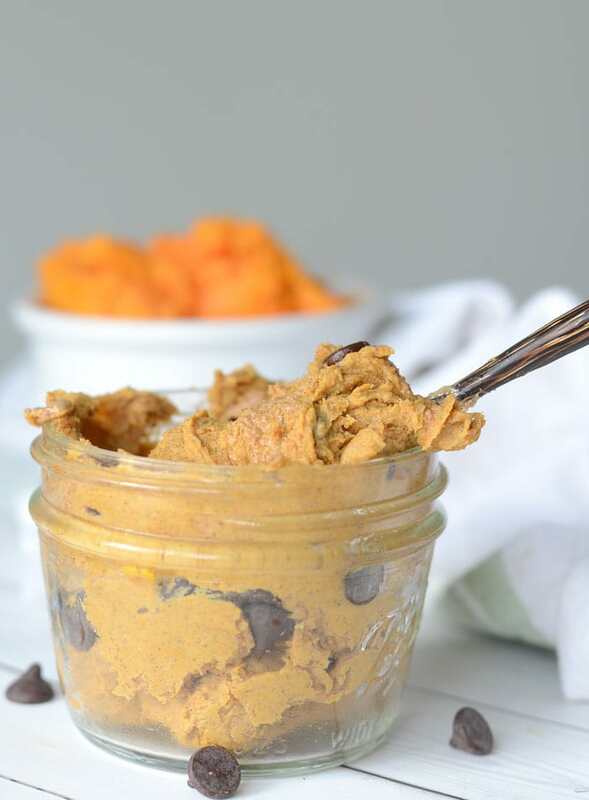 Canned pumpkin: a must-have and staple in my kitchen, awesome in smoothies, oats and baking! 3. Sweet potato puree : excellent source of vitamins and minerals and great for baking, adding to oats, pancakes and more! 4. Frozen fruit: once thawed, frozen fruit purees are great for making sugar-free jam, adding to oats and pancakes, using in baking and other recipes, my favourite is strawberries since they’re low in sugar. Try my strawberry protein oat bars! 6. Coconut yogurt: mixes well with protein or powdered peanut butter to make dips, frosting and pudding. 7. Cocoa powder: low in calories and perfect for all your chocolate creations, raw cacao powder is also a great option for it’s health benefits. 8. Vegan protein powder: add protein to pretty much any dessert recipe and making protein mug cakes, I use Vega Performance Protein for most of my recipes, Vega has a pea protein base which works great in most instances, I also keep a number of other vegan proteins such as hemp and brown rice, I like them for adding protein to smoothies, oats and energy bars. 9. Quick oats: awesome for baking, pancakes and other recipes. Try my protein cookie dough oats! 10. Cinnamon, pumpkin pie and other spices: add variety and flavour to your desserts without adding calories. 11. Banana: both fresh and frozen banana is a must-have at all times! Try my baked chocolate banana oatmeal bars! 12. Dairy-free chocolate chips: not exactly healthy but I like how far 1 tablespoon can stretch so I always keep some on hand for chocolate-craving emergencies, dark chocolate is also a good option. 13. Powdered peanut butter: absolute must-have for macro-counting peanut butter lovers, I use Naked brand. Try my peanut butter banana cookies! 14. Stevia – I use powdered stevia or liquid stevia drops for a calorie-free sweetener. 15. Unsweetened almond milk – very low calorie, dairy-free alternative to cow’s milk, excellent in all sorts of dessert recipes. 16. Zuchinni – grated zucchini can be handy for adding volume to baking. Try my skinny chocolate chip zucchini muffins! Other than that, keep baking basics such as baking powder, baking soda, arrowroot starch and a good quality sea salt and you’ll always be ready to make a healthier option to satisfy your sweet tooth. Even though I love sweets and include them in my diet almost daily, the base of my diet is still vegetables. Try not to go crazy with an “if it fits my macros” mindset. You can easily reach your daily macro goals through healthy, low sugar whole foods. The great thing about flexible dieting is that there is room to include treats but you should still make healthy choices for the most part. Micronutrients are just as important as macronutrients, especially if you want feel your best, and not be starving all the time! What works best for me is eating tons of non-starchy vegetables, some starchy vegetables and fruit, some grains, beans and lentils, some nuts and then I add protein sources like seitan, tempeh and tofu and fill in the gaps with a protein supplement. If you’ve read some of my earlier posts on vegan flexible dieting, I shared that I’ve found it nearly impossible to reach the protein requirements without some supplementation. That being said, it’s still possible to get most of my protein through whole food sources, without the need for a ton of soy products. Enough chit chat, right? Let’s get to this vegan protein cookie dough! Honestly, this isn’t much of a recipe, I just really love it so I thought it’s about time to share! 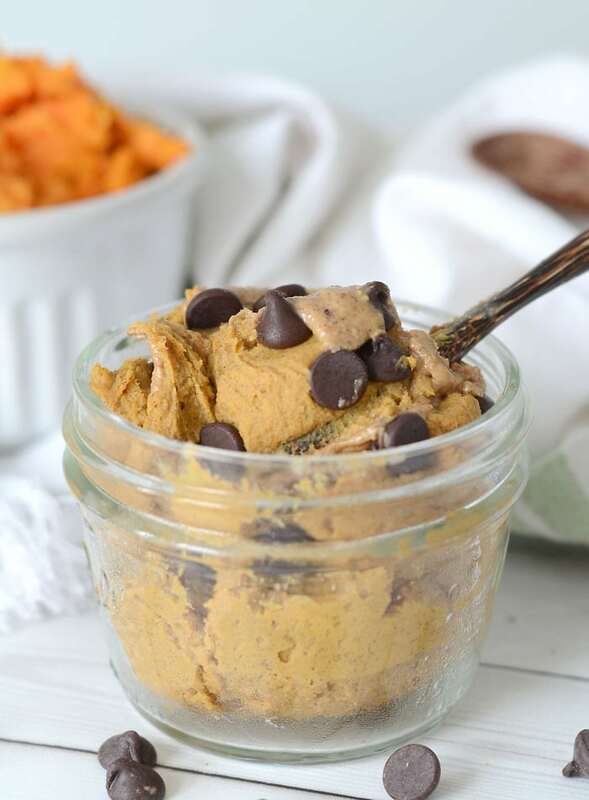 It’s made by blending baked sweet potato with Vanilla Vega Performance Protein. That’s it. 2 simple ingredients. I love the texture of Vega Performance Protein in recipes like this and even on it’s own. I often eat it as protein pudding just mixed with water, or mixed into applesauce, coconut yogurt or pumpkin puree. There are plenty of ways to customize this recipe. I usually keep it basic and then add my favourite toppings after. 1. 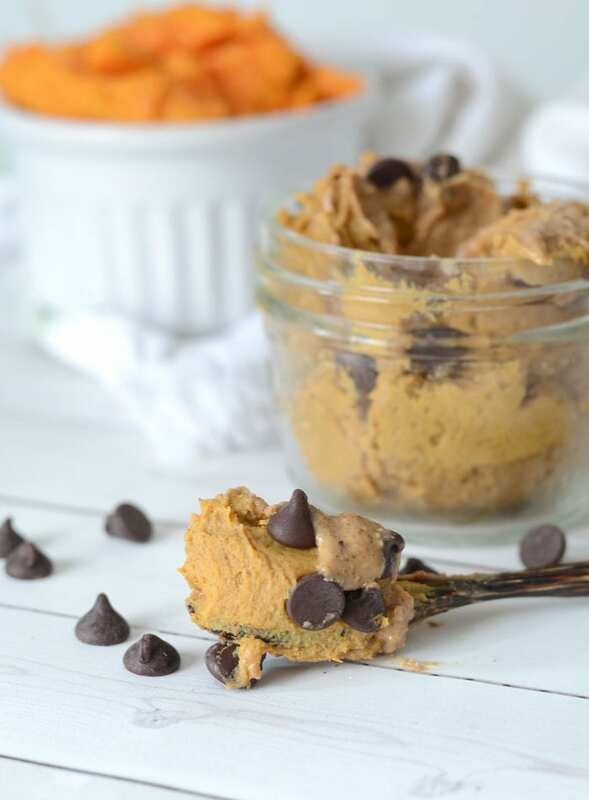 Low-Fat Peanut Butter Cookie Dough: replace some of the protein powder with powdered peanut butter. 2. Gingerbread Protein Cookie Dough: add 2 tsp cinnamon, 1 tsp ginger, a pinch of nutmeg, a pinch of salt and a drizzle of molasses. 3. Oatmeal Raisin Cookie Dough: replace some of the protein powder with oats, add raisins and cinnamon. 4. Double Chocolate Protein Cookie Dough: use chocolate Vega Performance Protein, replace a few tablespoons of the protein with cocoa powder, add chocolate chips. 5. 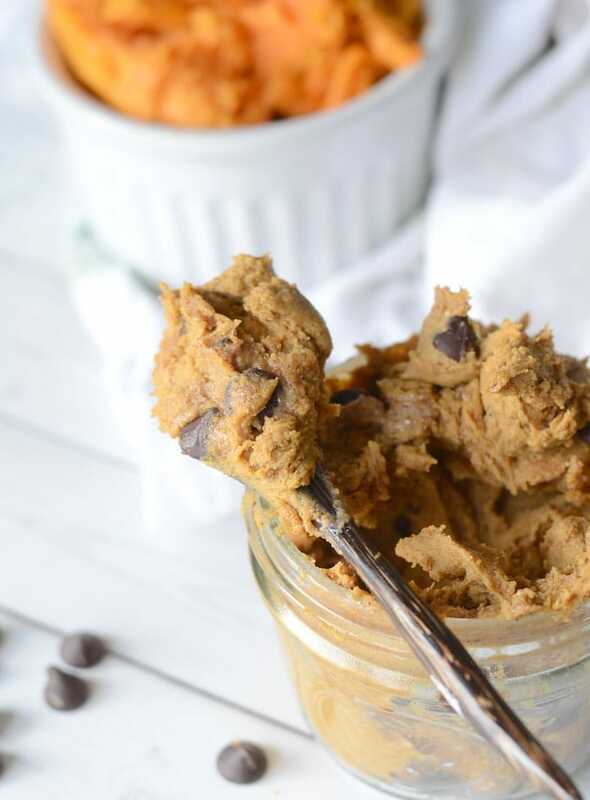 Snickerdoodle Protein Cookie Dough: add plenty of cinnamon, a drizzle of maple syrup and pure vanilla extract. 6. Coconut Macaroon Protein Cookie Dough: replace some of the protein with unsweetened shredded coconut and a few drops of coconut extract. You can add also chia seeds, hemp seeds, ground flax, maca…anything you can think of! It’s not super sweet so if you want it a bit sweeter, taste it after blending and sweeten with a bit of stevia. Sometimes I also add a dash of baking soda and a little pinch of sea salt to enhance the cookie dough flavour. Up to you! I use this recipe to make 3 servings but it could easily stretch into 4 or 5. If you make 3 servings out of it, the macros are 38 grams of carbohydrates, 3 grams of fat and 33 grams of protein. I usually add 1 tablespoon of almond butter when I eat it post-workout to get a bit more fat in after training. 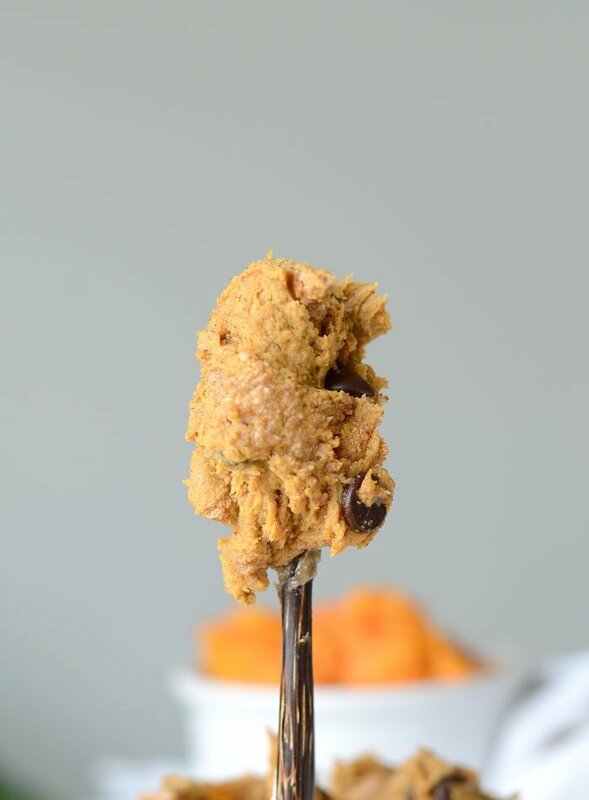 This 2-ingredient vegan protein cookie dough is amazing for breakfast topped with almond butter, coconut and chocolate chips! Keep a batch in the fridge and grab a spoonful anytime you feel a cookie dough craving coming on. Sugar-free, oil-free, gluten-free. Place ingredients in a blender or food professor and mix until it forms a thick dough. Place in the fridge for a few hours up to overnight to firm up. You can eat it right away but it’s best after chilled in the fridge! If you plan on topping with nut butter, try mixing it in before placing in the fridge. The texture with added peanut or almond butter is amazing! I usually divide my dough into 3 containers for food prep, then mix 1 tablespoon of almond butter into each one. Alternatively, you can add 3 tablespoons of nut butter to the blender when making the whole batch. YUM! To make the baked sweet potato, simply pierce your sweet potatoes with a fork a few times and place in the oven. Bake at 350 degrees until easily pierced through with a fork or knife. Let cool until you can handle them, the skin should easily peel off. Add to a blender or food processor with the protein and mix until smooth. I’d recommend adding a food scale to your kitchen for accuracy when baking and making other recipes. Volume amounts can vary greatly so cooking by weight is the way to go for best results. You can buy one here for under $15. « Previous PostWhy Am I So Hungry All The Time? This look so thick and fluffy – YUM! And I love your list of staple ingredients…I can relate to most of them! Looks so good! I get the most creative when I’m trying to lose weight and my calories are lowered as well! I tried this today and it’s delicious ???? Mine came out with more of an orange color, than your photo, but no worries there. I added a little almond extract to half and a little vanilla extract to the other half and they both taste great. Thanks for the recipe! Ooh, yummy. I love it with vanilla and a little pinch of sea salt. Glad you enjoyed it!